Welcome back to the Floorless Floors blog! Now that we’re well into the new year, many of you may be planning to start home improvements as part of your New Year’s resolutions; plans which may include updating your flooring. In a sea of flooring options, it can be quite overwhelming to have to choose between so many types. But if you’re looking for modern flooring with a sophisticated feel at a fraction of the price, high-gloss laminate flooring is a fantastic option that you’ll want to consider. 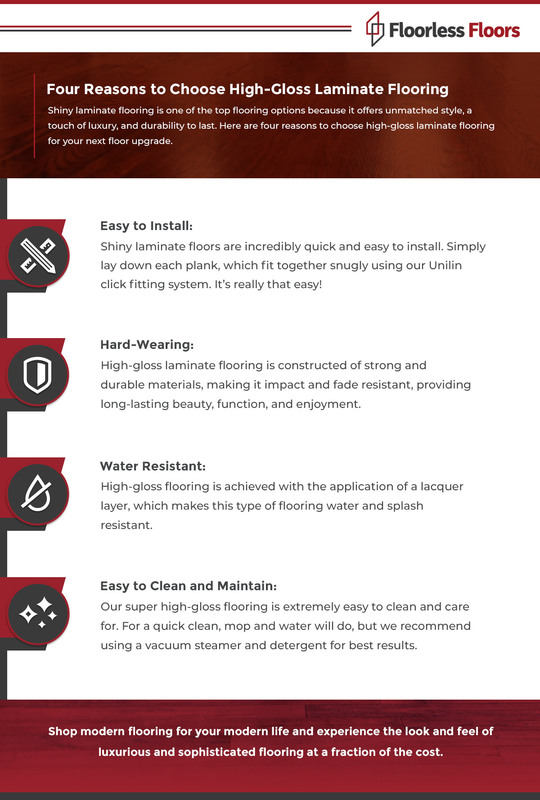 Today, the flooring experts at Floorless Floors will share with you four reasons to install high- gloss laminate flooring in your home. Ready to shop our range? Visit Floorless Floors to find affordable modern flooring for your modern life, or visit our warehouse in High Wycombe, which is open seven days a week for convenient, in-person collections. To be quite frank, high-gloss flooring is one of the easiest types of flooring to install. Simply lay down each plank, which fit together perfectly thanks to our simple Unilin click fitting system. Installing laminate flooring has never been easier and can be completed in a timely fashion. Laying down high-gloss flooring is simply the stress-free way to update the floors in your home. High-gloss flooring is one of the most durable types of flooring on the market, which is one reason why it is also one of the most popular options. While any type of shiny laminate flooring can be scratched or scuffed, we use a tough lacquer layer that is meant to stand up to the test of time. Better yet, high-gloss laminate flooring is impact and fade resistant, providing lasting beauty, function, and enjoyment. One of the top reasons to choose shiny laminate flooring over other options is because it is water and splash resistant. This makes cleaning up spills extremely easy. There’s no need to worry about water penetrating to the underlying layer of your flooring because the layer of lacquer functions as a barrier. Our super high-gloss flooring is extremely easy to clean and care for. Where some flooring, like hardwood flooring, requires special floor cleaning products, our range of high-gloss flooring can be cleaned with a mop and water. For a deeper clean that delivers better results, we recommend using a vacuum steamer with detergent to give your floors an extra shine. Are you ready to add a touch of luxury to your home? 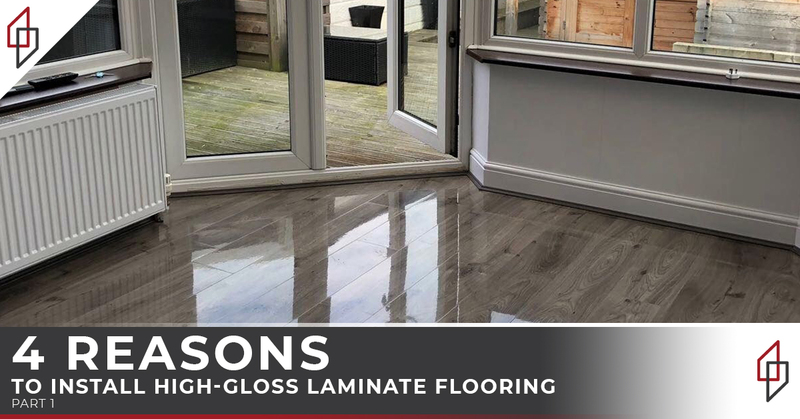 At Floorless Floors, we specialise in high-gloss flooring, which makes us a leading retailer of high-quality flooring in the UK. Shop our range of high gloss laminate flooring featuring stunning textures and colours. When you find selections that speak to your unique style, feel free to order samples, all priced at £0.99. When you settle on a flooring option, we deliver across the UK, or you can visit our warehouse to collect your flooring in person. Visit Floorless Floors today to add the perfect touch of luxury and sophistication to your home at a fraction of the cost.